I have been working on a few pieces for fall this year. Not too many…but I do have a mini-winter collection coming up in a few weeks, because I can’t help but doing something with a color story….I just can’t…but for fall I mostly did store-bought (boo…I wish I had more time). But for school, I have made a few things that are easy, comfy and still look super cute on for Hannie to wear year round. And I decided an update to the tee-shirt dress was in order for school. It’s actually become one of her favorites the last couple of weeks so I know it will get a lot of wear. 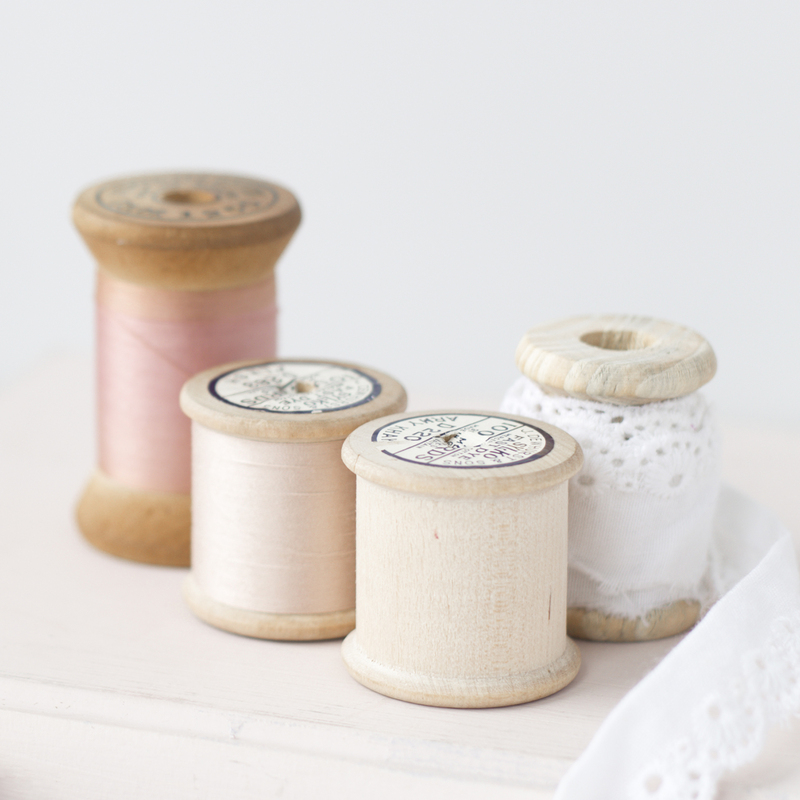 That’s what I love to focus on sewing-wise—classic, versatile pieces that will get used out! 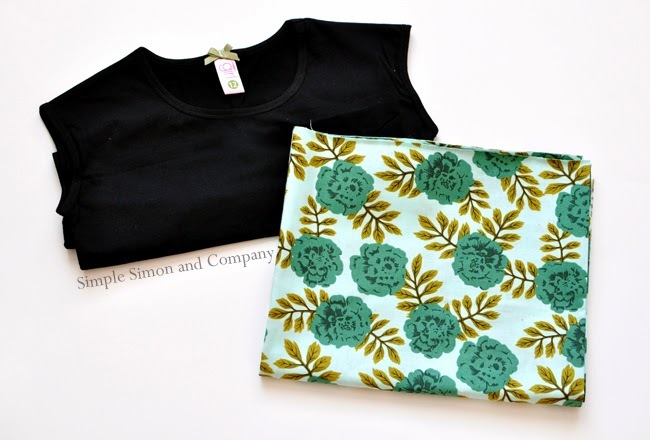 I started with this tee and then used one yard of fabric for the skirt part (it’s not an affiliate link…we just love and buy the shirts–I size up when buying the girls sizes ;). We bought quite a few of the tee shirts at the beginning of school and I actually pulled this one out of her drawer before it was worn to make the dress (yay for already having one!). I cut the one yard of fabric into 2 -18 inch by 45 inch lengths. Then I sewed up the two skirt strips into one-big-skirt-tube of fabric. 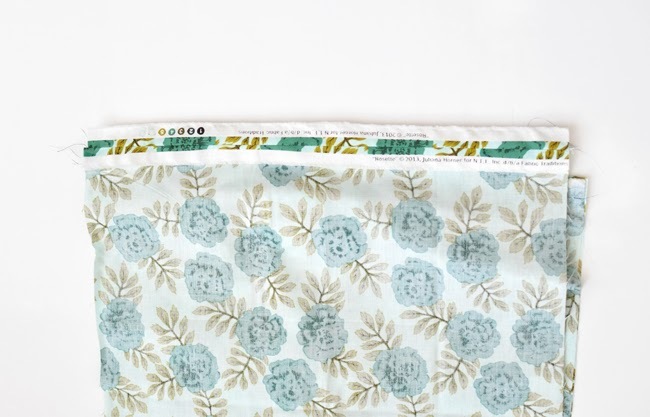 Next, fold over the top of the skirt .5 inches and sew a gathering stitch around the whole skirt tube. Then pull the gathering thread slowly and carefully until your skirt tube matches your tee shirt. 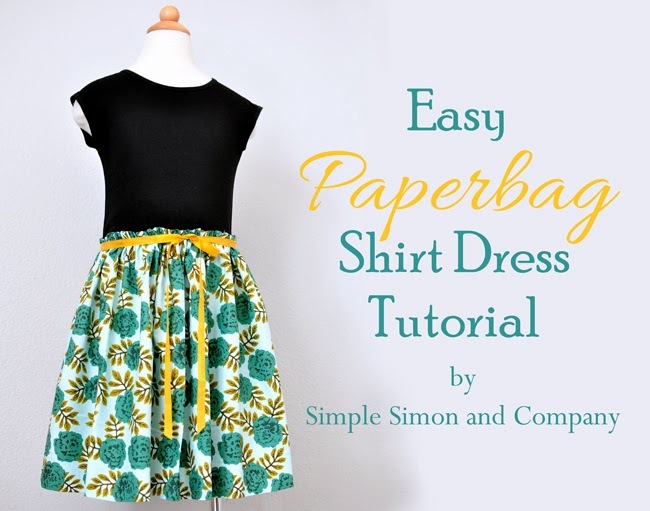 You now want to turn your tee shirt inside the skirt and sew it on. Again, go slowly and carefully so you don’t stretch the knit as you are sewing the woven fabric onto it. 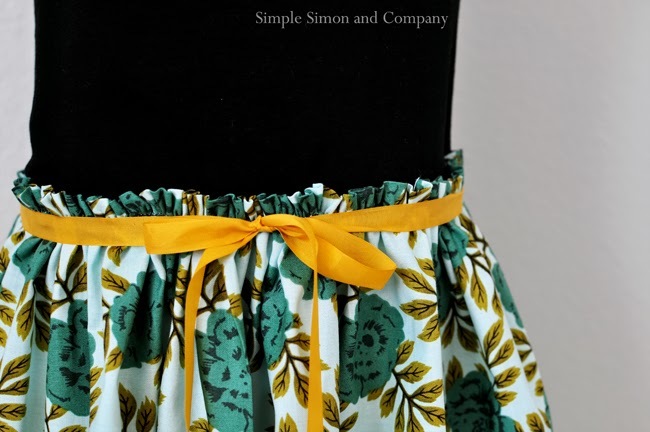 I did add a mustard colored seam binding for a ribbon….but it is actually just tacked down on one seam and then tied in a bow when it is worn. Easy peasy…. 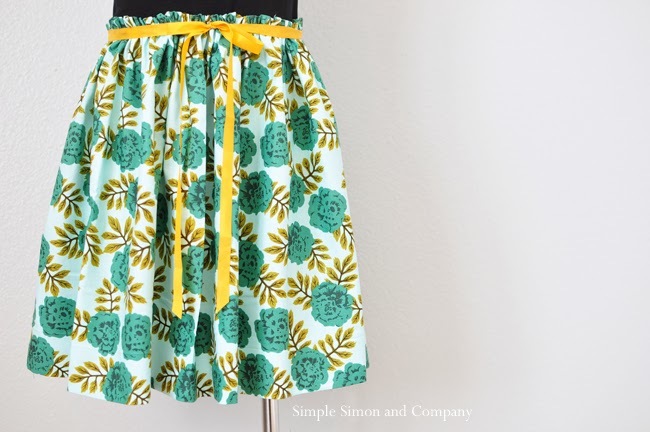 The final step is to hem up the bottom of your woven skirt and you are done! 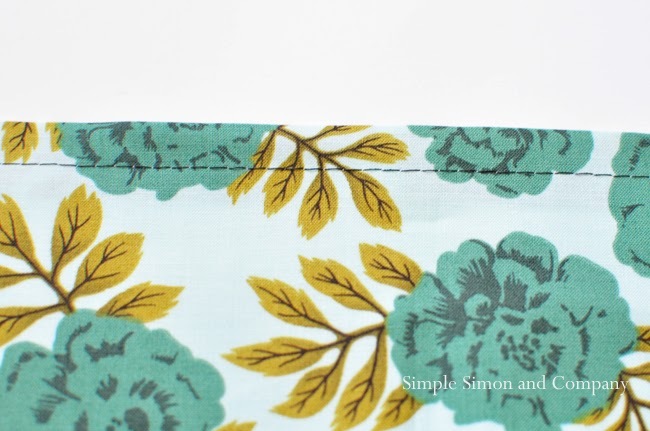 Are you sewing for fall this year? Pretty dress and simple too; love it!!! The mustard ribbon is perfect! Thanks for sharing!! This looks super cute! How do you get it on tho? Once you sew a straight stitch onto the knit it doesn’t stretch- right? No, it doesn’t stretch after it’s sewn….so you do need to size up on your tee shirt. 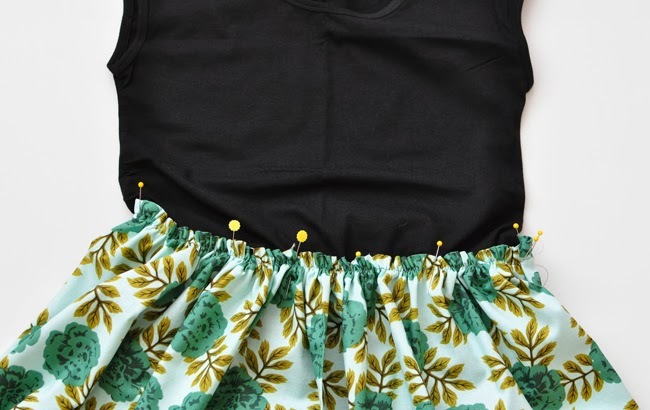 I wouldn’t use a super tight fitting tee with this technique—or you can shirr it instead of sewing a straight stitch. So so cute! I love it, love it, love it!!! Love the pattern. I made one for my niece but changed it a little. She is a little on the chubby side so instead of using thread to gather the skirt, I used thin elastic. I then attached it to the top with a small zigzag stitch.That way it stretches when she puts it on and fits her better. hi, quick question, which length do you sew to make the skirt into a tube? the 18″ length or 45″ length?